← Christmas Goodies and Weight-watching – Are They Oxymorons? An agent rejected my cookbook proposal for More than Lettuce, a cookbook for heart patients and diabetics, but I will send it out to cookbook agents. Meanwhile, I will still work on a few more recipes to add. I tried a new recipe for apple cheesecake bars and substituted enough Stevia to make the sugar content okay for diabetics, even with the dribble of caramel syrup. In the interest of saving time, I sliced the apples instead of chopped them finely as the recipe called for. I could have used my blender, but did not want to have to wash it. Making the crust was easy, but it never got even lightly brown, although I cooked it longer than the recommended time. After I added the cream cheese layer, the sliced apples, and the streusel layer, I baked it the recommended time in a 9 X 13 pan. The recipe said to cut it in 36 pieces. Each serving would have only 7 grams of sugar, but it would not be much bigger than the size of a piece of fudge. Instead I cut it into 24 pieces. In the picture, you can see 12 pieces. Now, I’ll have to refigure the amount of Stevia to use to make it right for 24 servings. However, there was another problem. 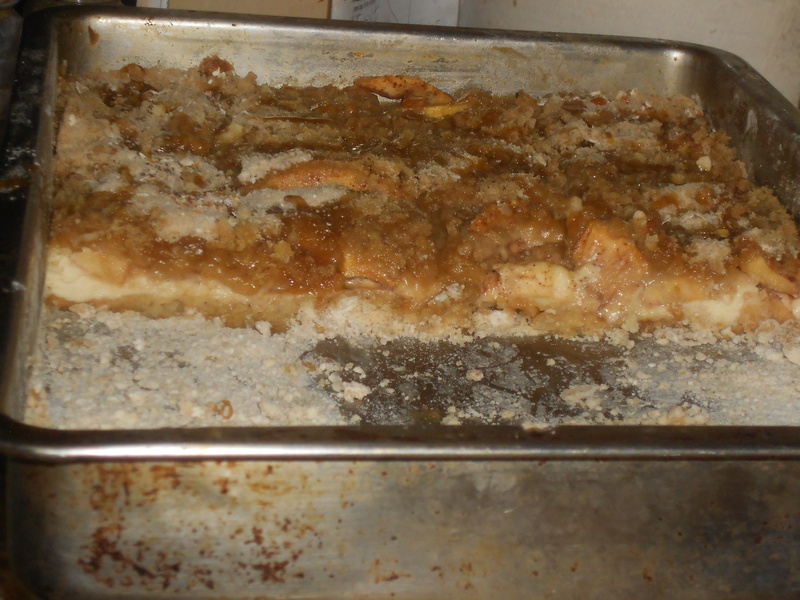 The result was delicious, except the crust was bland, despite the inclusion of brown sugar, and kept flaking. Probably more than 1/3 cup margarine would have helped. I would have preferred the crust for my recipe for Strawberry Cream Cheese Pie, which called for less flour, more margarine, more brown sugar, and chopped nuts. It also made enough for three 8” pans. Here is the recipe for that. For the crust, mix ingredients together and pat into three 8-inch round pans. Bake at 400 for 12 minutes. Crumble with fork and press back into pans. Let cool before adding filling. Soften cream cheese with a mixer, and blend in the powdered sugar and vanilla. Prepare Dream Whip as directed and fold into the cream cheese mixture. Chill one hour. Add cherry pie filling or strawberry topping. To prepare strawberry topping, mix cornstarch with strawberries and heat to boiling. Boil one minute (to completely cook the cornstarch and eliminate that raw taste). Let cool to room temperature and spread on top. Makes 48 servings with 7.5 grams sugar per serving for the low-calorie version. Next, I’ll try it using Cool Whip instead of Dream Whip, which is getting hard to find. This entry was posted in Delicious dishes and tagged cooking experiment, Strawberry Cream Cheese Pie. Bookmark the permalink.